Stop and stair: Mega Mall raises the bar. Oberoi Mall looks like it was shipped from Orchard Road. Sunlight pours in to make artificial lighting redundant. The atrium allows uninterrupted views of every shopfront. UK department store Debenhams chose wisely. Other brands: Barbie, Central, Esprit, Samsaara and Chemistry. Gloria Jean’s Coffee feels like a cross between a Changi airport lounge and the Oberoi lobby coffee shop. Oberoi Mall, International Business Park, Goregaon (E), Mumbai (28424050). 11am-10pm. Posters advertise the 1 million sq. ft Nirmal Lifestyles as “India’s largest shopping mall". We wondered if the neighbours use the massive sunbathed atrium for their morning jog. The food court is extensive: Chak de Chaat, Rajdhani, Thai Chi, Only Parathas, Crazy Corn, Hogdogs, Juice Lounge, Tibb’s Frankie, The Banana Leaf, Natural’s ice-cream and Walls Swirls Softee… The atrium also has the entrance to Shoprite Hyper and a six-screen PVR. A lot of activity for one atrium, yet no area feels crowded. Nirmal Lifestyles, LBS Marg, Mulund (W), Mumbai (67973180). 10am-10pm. 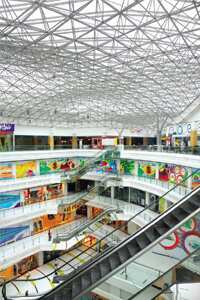 Mega Mall, Oshiwara New Link Road, Andheri (W), Mumbai (40096665). 10am-11pm. Sorry Sir lingerie, Flags shirts and jeans, Mr Deals — the Best Bargains T-shirts. The low prices run into the food court, too. Siddhi offers Chinese meals for Rs90. Saras has a bruschetta platter at Rs25. Also here: New York Bite veg and Jain food; Dosa Delight with “109 dosas", even a “Singapore salad roast dosa"; Chetna Kulfi with chocolate fountain; Rishi Rich Soda Pub. Raghuleela Mall, Kandivali (W), Mumbai (28630306). 10.30am-11pm. Huma is packed with factory outlets. Besides designer Priyadarshini Rao’s prêt label Sepia, there is Parx, Benetton, Globus, Wellhome, Pepe, John Louis, Peter England, Provogue, Oxemberg, Hakoba and Cottons. Food stalls include Let’s Chaat, Frankie, Cafe Coffee Day, and Gokul ice cream serves jackfruit and orange ginger flavours. Huma Mall, LBS Marg, Kanjurmarg (W), Mumbai (25785421). 10am-10pm. Most brands here target teens and 20-somethings: Wrangler, Lacoste, Forever New, Tresmode, Nautica, Next. Plenty of grab-and-walk food: rolls, ice cream, coffee, sandwiches. There’s bowling and beer at Sports Bar. Sky Zone, High Street Phoenix, 462, Senapati Bapat Marg, Lower Parel, Mumbai (24964307). 11am-10pm. In an area full of electronics shops, Orchid City Centre remains the most unintimidating mall south of Bandra. Women in hijabs stroll into lingerie stores. Families squeeze into the Sketch Express kiosk. A vending machine offers Eraser cream. Kids can be pushed into Kangaplay as parents work out at Talwalkar’s gym. The food court has only Indian options: Mohammed Ali Road’s Noor Mohammadi, beet juice, malai nariyal pani and a golawala. Orchid City Centre, 265/E, Belasis Road, Mumbai Central (66104300). 11am-10.30pm. At the entrance, D&D Promoters promote a karaoke machine by belting out old Hindi songs. Just beyond, a Big FM stall promotes the radio channel with English pop. The mall speakers have a peppier playlist than any of the others. Palm Beach Galleria, Plot 17, Sector 19-D, Palm Beach Road, Vashi, Mumbai (65127771). 10am-10pm. Chances are parents shop at InOrbit because their kids play at Time Zone. It has a toy train, rocking bus, merry-go-round, riding games, arcade games, jet-ski simulators, SoftPlay (soft jungle gyms), soft toy counter, and dance revolution machine. Large signs show you to a baby care room. Inorbit Mind Space, Link Road, Malad (W), Mumbai (66777999/67069569). 10.30am-9.30pm.